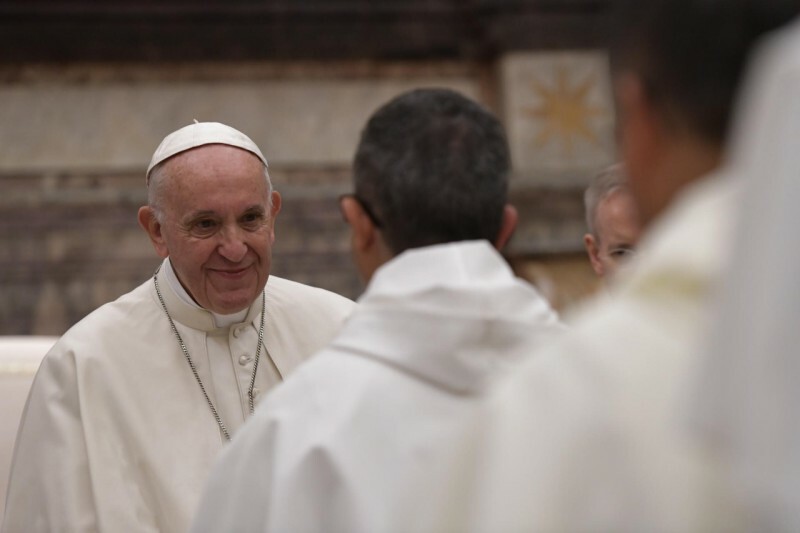 The Holy Father remarks came in the Clementine Hall of the Vatican Apostolic Palace, where he received in audience the religious of the Order of the Blessed Virgin Mary of Mercy (Mercedarians), on the eighth centenary of its foundation. I welcome you to this meeting. I am grateful for the words addressed to me by Fr. Juan Carlos Saavedra Lucho, General Master of the Order, and may God conserve his enthusiasm. You are concluding the Jubilee for the eighth centenary of the foundation of the Order; a time of grace in which you have had the opportunity to experience God’s merciful love on the path you have traveled, as well as to examine the present and establish guidelines to continue with renewed spirit. In this meeting, I wish to put before your eyes that first love that you express with the vow of redemption. In it you promise “to give life as Christ gave it for us, if necessary, to save Christians who are in extreme danger of losing their faith, in new forms of captivity” (Constitutions, 14). Very recently, to one of you, I said: What problems do you have there? “Well, I have the vow to give my life”, he replied. These words remind us all, and especially the religious, that following Christ means giving your life to save souls. We all know the importance of following Christ, but sometimes instead of following Him, we propose our life as if He were the one who has to follow us – the caprices of the religious are difficult, my God, they are very difficult – it is He Who has to adjust to the plans and projects that we make and create. This is the temptation, no? Following Jesus is not a matter of methodology, but in letting Him precede us and set the pace for our journey, personally and as a community. The Mercedarian charism is current and is required to let itself be challenged by new fields of action and “redemptive service”, such as the promotion of the dignity of the human person, the prevention of physical or spiritual slavery, accompaniment and reintegration of the most vulnerable in our society. The redemption of the captive, that is – rest assured that today there are many more, more than twice as many captives than at the time of the founding of the Order. The Mercedarian family consecrated persons, and laity needs to be inspired by this “creativity of God”, even if that means having to challenge the mindsets that, over time, have been superimposed on the founding charism. That always happens to us with the founding charisms, as time goes by they become opaque and are covered up, and if we are not careful to remove those coverings, those husks, the charisma becomes like the husk of a coconut afterward, and it is hard to get back to what is inside. It is to remove those husks of time to return to that, to the primitive intuition, which is a call from God. He who follows Christ does so by giving his life; it is not a partial following. The poor young rich man wanted to follow just in part, and he could not. This puts us before the core truth of our religious consecration. To trust in the Lord means to give ourselves to Him without keeping anything in our pocket; not only giving the material and the superfluous but giving everything we consider as our own, even our tastes and opinions. The surrender of one’s life is not something optional but is the consequence of a heart that was “touched” by God’s love. Please, I ask you not to allow yourself to be tempted to consider your sacrifice and surrender as an investment destined for personal gain, to achieve a position or a life security. No! This, no. Endeavor to make this oblation and consecration to the service of God and of men, living the joy of the Gospel through the charism of redemption. Those who let themselves be saved by the Lord are freed from sin and, above all, from sadness, from inner emptiness and isolation (cf Evangelii Gaudium, 1). To give life is to find it in those who have been redeemed by the Lord through our example and testimony. The Order of Mercy echoes the Gospel of salvation that says: “The Lord has … come to His people and redeemed them” (Lk 1: 68). Thus, the gesture of “visiting and freeing” marks all its vocation and missionary action. You are called to go out to save Christians who are in danger of losing their faith, who are degraded in their dignity as persons and entangled in principles and systems contrary to the Gospel. Today, as in other eras of history, the Christian is threatened by this triple enemy: the world, the devil and the flesh. It is not a thing of the past, but of the present moment. These dangers are sometimes camouflaged and we do not recognize them, but their consequences are obvious, and they numb the conscience and provoke a spiritual paralysis that leads to inner death. We must also be careful not to fall into that state of lack of spiritual vitality. Let us think about the spiritual worldliness that enters in a subtle way in our life and obscures the beauty and strength of that first love of God in our souls (see Gaudete et exsultate, 93-97). You, as members of a redemptive order, must first experience in yourselves Christ’s redemption so as to help your brothers discover the God Who saves. “Redeemed to redeem” is a good definition of your life and vocation. I invite you to continue being bearers of the Lord’s redemption to prisoners, refugees, and migrants, to those who fall into the networks of human trafficking, to vulnerable adults, to orphaned and exploited children … Take God’s tenderness and mercy to all those who are discarded by society. Dear brothers: I encourage you in your vocation and your mission, and do not tire of being instruments of freedom, joy, and hope. May this eighth centenary of the Order produce abundant fruit of grace and holiness, and be a constant encouragement to following Christ by giving life for all men in the times in which we live. May the Virgin of Mercy and Saint Peter Paschal, whose memorial we celebrate today, intercede for you all and accompany you on your journey. And please, do not forget to pray for me. Thank you.